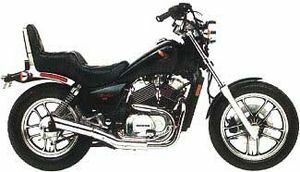 The Honda VT500C is a motorcycle produced by Honda from 1983 to 1986. 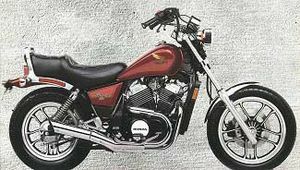 The Honda Shadow 500, designated VT500C'83, was sold in 1983. 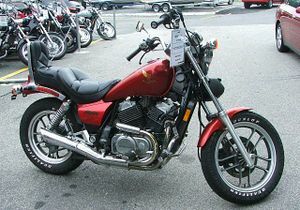 Two colors were available: Candy Wineberry Red and Black. 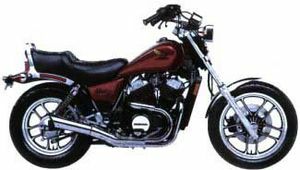 The fuel tank and rear fender were one of the two basic colors (red or black), but the side covers were chrome and the engine covers were black. The side cover decal "Shadow 500" was black and red with gold overlay. The headlight was rectangular and chrome. There was only a single horn. 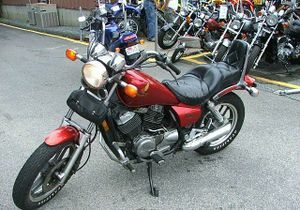 The VT500C'84 Shadow 500 was sold in 1984 in one of two colors: Candy Scorpio Red or Black. The side covers were the basic color (red or black). The engine covers were black. The side cover decal "Shadow 500" was black and red with gold overlay. The headlight was rectangular and chrome. 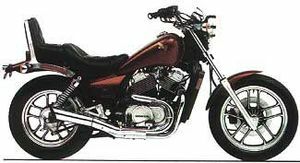 The engine was a 491cc OHC 3-valve liquid-cooled V-twin linked to a 6-speed transmission and a shaft drive. This page was last edited on 28 November 2010, at 21:21.